Vancomycin is one of the most widely used antibiotics for the treatment of serious gram positive infections involving methicillin-resistant S. aureus (MRSA). However serum vancomycin concentrations are need to be monitored in a relatively narrow range to lessen the potential for nephrotoxicity and ototoxicity and to achieve therapeutic concentrations. High risk of toxicity, such as patients receiving concurrent nephrotoxins. Those receiving prolonged courses of therapy (over three to five days). Because this toxicity is rarely associated with monotherapy and does not correlate with serum vancomycin concentrations. Monitoring may be more important when other ototoxic agents, such as aminoglycosides, are administered. AUC/MIC is a predictive pharmacokinetic parameter for vancomycin. AUC/MIC ratio of ≥400 is proposed as a target to achieve clinical effectiveness with vancomycin for the treatment of both methicillin susceptible S. aureus (MSSA), MRSA, and vancomycin-intermediate S. aureus (VISA) strains. Trough serum vancomycin concentrations are the most accurate and practical method for monitoring vancomycin effectiveness. 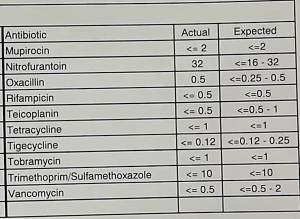 It is recommended that trough serum vancomycin concentrations always be maintained above 10 mg/L to avoid development of resistance because there are evidence suggesting that S. aureus exposure to trough serum vancomycin concentrations of <10 mg/L can produce strains with VISA like characteristics. To improve clinical outcomes for complicated infections such as bacteremia, endocarditis, osteomyelitis, meningitis, and hospital acquired pneumonia caused by S. aureus, total trough serum vancomycin concentrations of 15–20 mg/L are recommended. The current current susceptibility breakpoints for glycopeptides have been reviewed by CLSI and clinicians are encouraged to make sure that clinical microbiology laboratories with which they are associated are using the revised vancomycin susceptibility breakpoints for S. aureus. This revision is based on the following data. Michael Rybak et al. Therapeutic monitoring of vancomycin in adult patients: A consensus review of the American Society of Health-System Pharmacists, the Infectious Diseases Society of America, and the Society of Infectious Diseases Pharmacists. Am J Health-Syst Pharm. 2009; 66:82-98. Fred C et al. The Rationale for Revising the Clinical and Laboratory Standards Institute Vancomycin Minimal Inhibitory Concentration Interpretive Criteria for Staphylococcus aureus. Clin Infect Dis 2007; 44: 1208–15. Sakoulas,G et al.Relationship of MIC and bactericidal activity to efficacy of vancomycin for treatment of methicillin-resistant Staphylococcus aureus bacteremia. J Clin Microbiol; 42: 2398–2402. Mandy Wootton et al. Evidence for Reduction in Breakpoints Used To Determine Vancomycin Susceptibility in Staphylococcus aureus. Antimicrob Agents Chemother 2009; 49: 3982-3.